The theory was simple. Make returns on “cash” so low it is forced out of savings account and into risk assets. 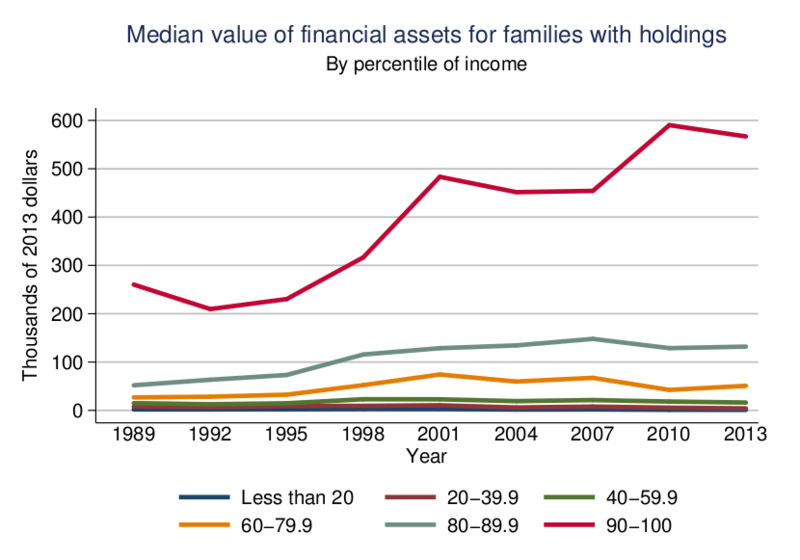 While the ongoing interventions by the Federal Reserve have certainly boosted asset prices higher, the only real accomplishment has been a widening of the wealth gap between the top 10% of individuals that have dollars invested in the financial markets and everyone else. This was shown by the Fed’s most recent consumer survey. Take a look at that graphic carefully. 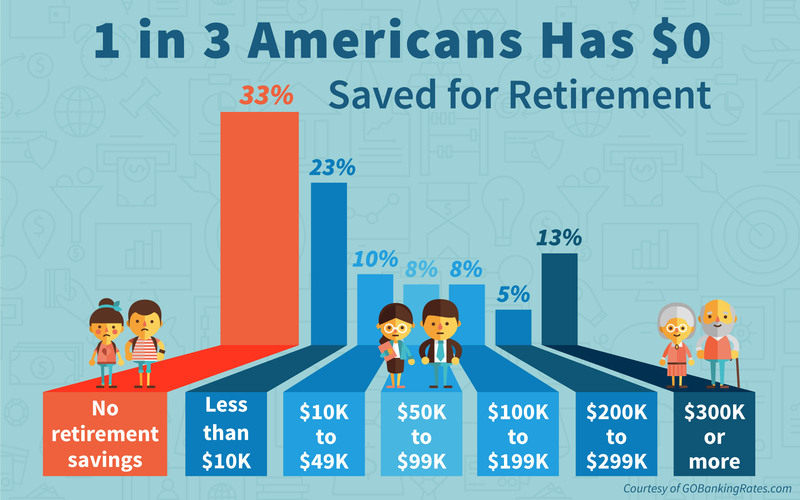 33% of Americans have $0 saved for retirement. 66% have less than one-year of median income saved. 74% have less than $100,000 saved for retirement. With 3/4th’s of America dependent upon an already overburdened social security system in retirement, the “consumption function,” on which roughly 70% of the economy is dependent, is being grossly overestimated. As I noted in this past weekend’s missive, the level of cash being held by individual investors currently is near record lows. This is a true statement ONLY IF you hold cash for an EXTREMELY long period. However, holding cash as a “hedge” against market volatility during periods of elevated uncertainty is a different matter entirely. It is relatively unimportant the markets are making new highs. The reality is that new highs only represent about 5% of the market’s action while the other 95% of the advance was making up previous losses. 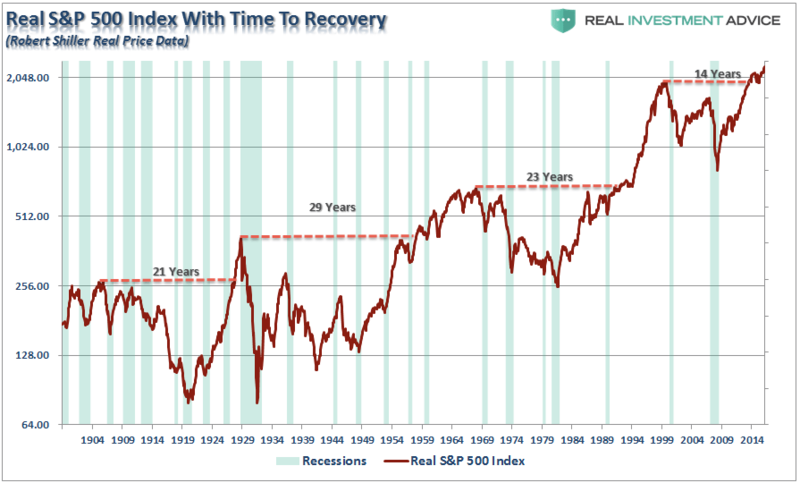 “Getting back to even” is not a long-term investing strategy. The chart below shows the inflation-adjusted return of $100 invested in the S&P 500 (capital appreciation only using data provided by Dr. Robert Shiller). The chart also shows Dr. Shiller’s CAPE ratio. However, I have capped the CAPE ratio at 23x earnings which has historically been the peak of secular bull markets in the past. Lastly, I calculated a simple cash/stock switching model which buys stocks at a CAPE ratio of 6x or less and moves back to cash at a ratio of 23x. I have adjusted the value of holding cash for the annual inflation rate which is why during the sharp rise in inflation in the 1970’s there is a downward slope in the value of cash. However, while the value of cash is adjusted for purchasing power in terms of acquiring goods or services in the future, the impact of inflation on cash as an asset with respect to reinvestment may be different since asset prices are negatively impacted by spiking inflation. In such an event, cash gains purchasing power parity in the future if assets prices fall more than inflation rises. While no individual could effectively manage money this way, the importance of “cash” as an asset class is revealed. 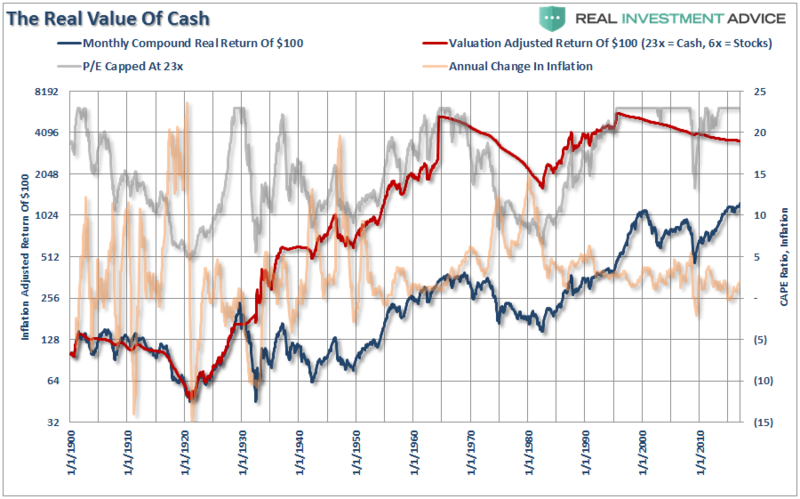 While cash did lose relative purchasing power, due to inflation, the benefits of having capital to invest at lower valuations produced substantial outperformance over waiting for previously destroyed investment capital to recover. While we can debate over methodologies, allocations, etc., the point here is that “time frames” are crucial in the discussion of cash as an asset class. If an individual is “literally” burying cash in their backyard, then the discussion of the loss of purchasing power is appropriate. However, if cash is a “tactical” holding to avoid short-term destruction of capital, then the protection afforded outweighs the loss of purchasing power in the distant future. 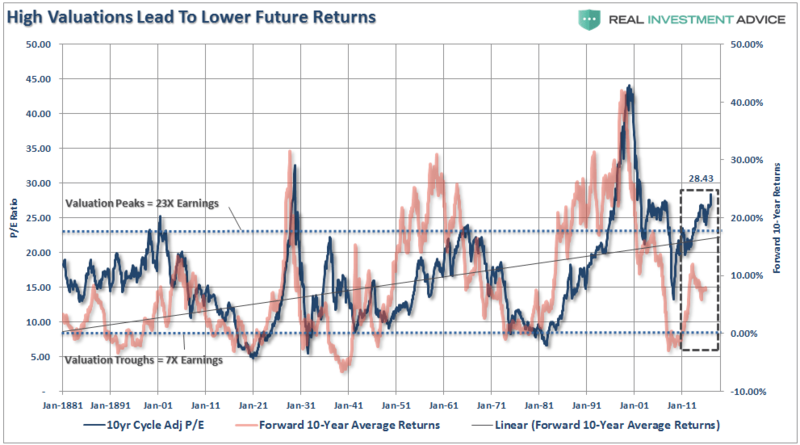 Much of the mainstream media will quickly disagree with the concept of holding cash and tout long-term returns as the reason to just remain invested in both good times and bad. The problem is it is YOUR money at risk. Furthermore, most individuals lack the “time” necessary to truly capture 30 to 60-year return averages. I’ve been managing money in some form coming up on 30-years. I learned a long time ago that while a “rising tide lifts all boats,” eventually the “tide recedes.” I made one simple adjustment to my portfolio management over the years which has served me well. When risks begin to outweigh the potential for reward, I raise cash. The great thing about holding extra cash is that if I’m wrong, simply make the proper adjustments to increase the risk in my portfolios. However, if I am right, I protect investment capital from destruction and spend far less time “getting back to even” and spend more time working towards my long-term investment goals. 3) The best traders understand the value of cash. From Jesse Livermore to Gerald Loeb they all believed one thing – “Buy low and Sell High.” If you “Sell High” then you have raised cash. According to Harvard Business Review, since 1886, the US economy has been in a recession or depression 61% of the time. I realize that the stock market does not equal the economy, but they are somewhat related. 4) Roughly 90% of what we’re taught about the stock market is flat out wrong: dollar-cost averaging, buy and hold, buy cheap stocks, always be in the market. The last point has certainly been proven wrong because we have seen two declines of over -50%…just in the past two decades! Keep in mind, it takes a +100% gain to recover a -50% decline. 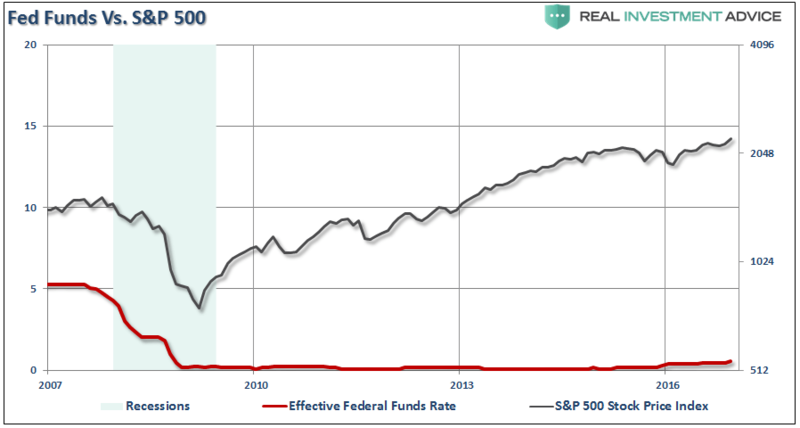 As stated above, near zero returns do not imply that each year will have a zero rate of return. However, as a quick review of the past 15 years shows, markets can trade in very wide ranges leaving those who “rode it out” little to show for their emotional wear. December 26, 2016 in Investment Markets, Retirement, Superannuation, Wealth Building.